By Allan Fox: WBA secondary heavyweight champion Manuel Charr (31-4, 17 KOs) called out Anthony Joshua and Tyson Fury today, saying he’s coming for both of them and he plans on coming to the UK to take them on. Sounding out of breath while jus standing, the 33-year-old Charr said he wants Joshua and Fury. Charr didn’t mention WBC heavyweight champion Deontay Wilder for some reason. That could mean one of two things. Either Charr feels he can make more money fighting Joshua and Fury or he simply doesn’t fancy mixing it up with powerful Wilder. Charr isn’t in the position to fight anyone right now other than his mandatory Fres Oquendo (37-8, 24 KOs), who he’s scheduled to fight on September 29 in Cologne, Germany. Manuel Charr needs to get the 45-year-old Oquendo out of the way before he starts calling out guys because he’s got a full plate right now. Oquendo hasn’t fought in four years since 2014, but he has a decent chance of beating Charr. 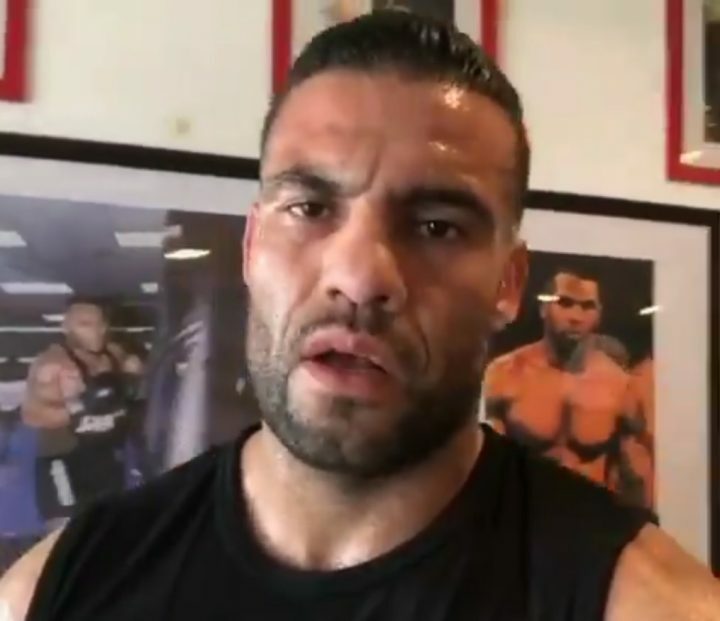 “I have a message for Tyson Fury and Anthony Joshua,” Manuel Charr said via FightingNow. “It’s my time. I’m coming for you guys to the UK, and I’m hoping to meet you in the ring. It will be the fireworks, I promise. Manuel Charr is back as WBA heavyweight champion. I’m coming for you, AJ. Tyson, AJ, I’m coming for you,” Charr said. What was alarming was how out of breath Charr was after he threw a few air punches during the interview. Charr looked gassed out after throwing the shots, and he couldn’t talk without taking deep breaths of air. The way Charr looked, he might not make it one round without tiring against Fury or Joshua. I could see someone like Fury fighting Charr, but not Joshua. I don’t think Joshua would ever entertain a fight against Charr, as it would be such a terrible mismatch. It’s a fight guaranteed to leave Joshua’s boxing fans furious when it turns out to be a one-sided massacre. Fury would probably take a fight with Charr in a second if he gets past Oquendo in September. Having the WBA title in his possession might help Fury get a better for a big payday fight against Joshua. That’s the guy that Fury wants more than anyone. If Fury beats Charr to capture his paper title, then he can sit down and negotiate with Joshua as a champion instead of just challenger. Charr won the vacant World Boxing Association World heavyweight title last November in beating 41-year-old Alexander Ustinov by a 12 round unanimous decision. It’s unknown why the WBA ranked Charr and Ustinov high enough for them to fight for their vacant WBC ‘regular’ heavyweight title, because there were a lot of arguably far more talented fighters than them in Jarrell ‘Big Baby’ Miller, Alexander Povetkin, Kubrat Pulev and Dillian Whyte. It’s easy to second guess the decision by the WBA to let those two guys fight for their title, but maybe they impressed with his win over Sefer Seferi. He’s the guy that Tyson Fury is fighting on June 9. Charr was knocked out by cruiserweight Mairis Briedis in the 5th round three years ago in 2015. Avenging that loss should be Charr’s goal right now rather than calling out Joshua and Fury.